Go to www.worthavegroup.com and click on "My Policy". 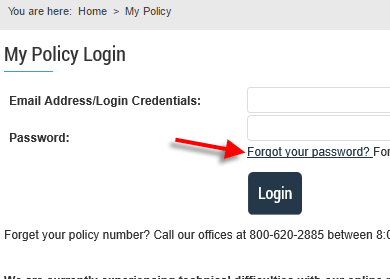 To login to your policy or policies, please enter your login credentials and password. Click "Login". 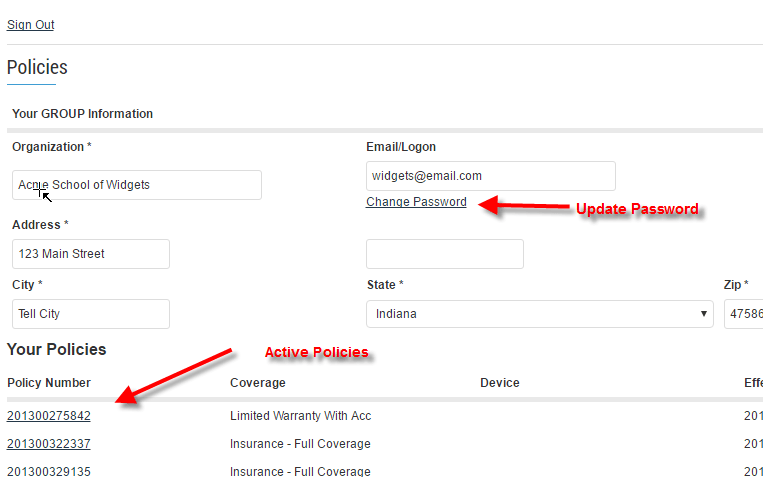 Once you have logged in, you will be redirected to the "Policies" page which lists all of your active policies. 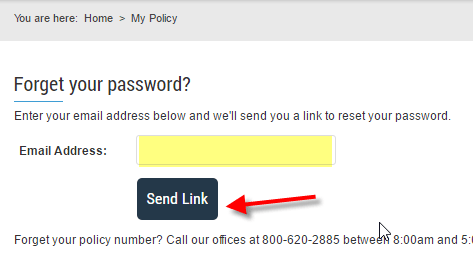 To access a policy, click the policy number. The policy details and list of device serial numbers will be presented. To narrow the serial number list, there is a search option. Enter a serial number or a partial number and press enter to search the list. To file a claim, click "Submit Claim" on the row with the applicable serial number. This will open the claim form. Contact Information: Enter in contact and mailing information for your claim. This information will repopulate for each subsequent claim during your session. 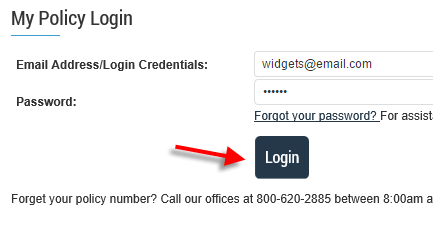 If you log out or your session expires, this information will need to be reentered. Remit to: This address is only used for payment to you if a device is not repairable. You will need to reach out to your sales representative to update this address. Date of Loss: Please enter the date in which the claim occurred. Box Needed? : If you already have one of our shipping boxes, please choose "Label Only". If you are out of boxes, please choose "Box and Label". Description of Incident: Enter the description of what happened to the device (i.e. the device was dropped down the stairs, the device was stolen from a locker, etc.). Known Damage: State the damage or symptoms the device is showing as a result of the incident (i.e. the screen is cracked, the device is not holding a charge, etc.). Fraud statement: Review and acknowledge that you have read and understand the statement. 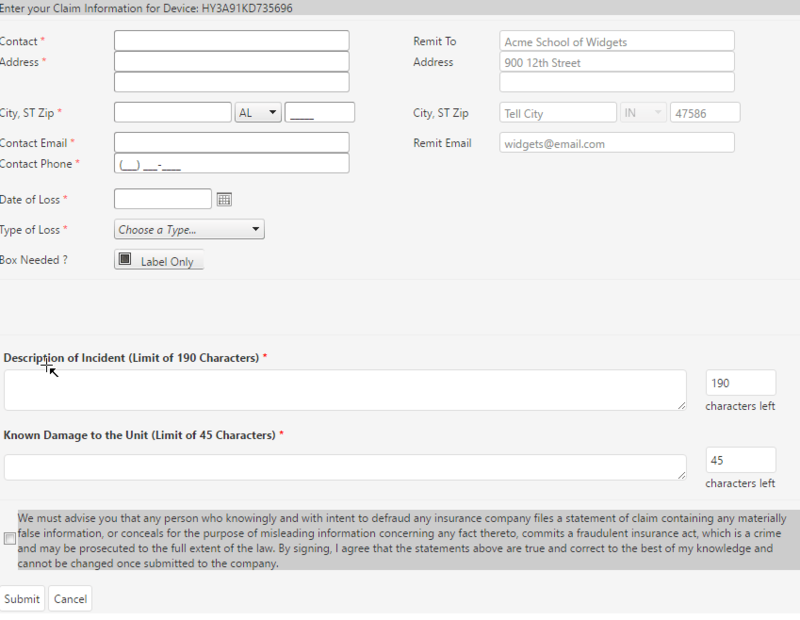 After clicking submit and successfully adding a claim, a message will appear. On the login page, click "Forgot your password". Enter your email address and click "Send Link". An email will be sent with a link to reset password form. Check your inbox/spam folder for an email from Worth Ave. Group. The link will open a form to set a new password. Type in your new password you would like to set for your account. Confirm the password by typing the new password in again. Click "Reset Password". After successfully changing password, click “Return to Login” to login. Step One: Print the Claims Checklist. Following this checklist can reduce delays when submitting your claim. Step Two: Print the Claims Form. Fill out the form so we have all your information. Step Three: Submit your claim by fax, email, or mail. We will contact you when we receive your claim. All iPhone and cell phone claimants must submit a copy of their driver's license and a copy of their phone upgrade status, in addition to proof of ownership for the original phone. You may be requested to send us your damaged item prior to the payment of the claim. submits an application or files a claim containing a false or deceptive statement is guilty of insurance fraud-- a Federal Offense.